You are going to learn how to make a game on our Raspberry Pi from the ground up. While countless millions of us take great pleasure spending hours racking up high scores in our favourite games, few of us are ever exposed to the delights of making them in the first place. It's far from easy, but learning to code your own shoot-'em-up is infinitely more satisfying than beating any end-of-level boss. 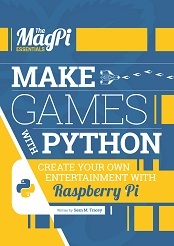 Although this book is designed to help you learn many of the essential skills you'll need to make games with Python and Pygame on your Raspberry Pi, it's by no means definitive. Frankly, you could read a dozen books on the subject and still not have the skills you need to succeed. This book isn't for absolute programming beginners, but it's not far from it: we're going to assume that you've written some simple Python (or similar) programs in the past, and are able to do things like creating files and get around your Pi's filesystem without too much difficulty. If you haven't set up your Pi and are a little lost on how to go about it, there are lots of easy-to-follow guides on the web which will help bring you up to speed.